Debts are bad and savings are good. Any homily on good moral values wouldn't have missed this out. Your parents and grandparents would have impressed this on you since your childhood days. But let's see what happens if everybody saves and none borrows. In modern times, this probably doesn't matter because you can always save. Whether others borrow is none of your business and you probably couldn't care less. In fact you should. A hypothetical situation would shed some light. Imagine a situation on an isolated island with only two inhabitants, A and B. Each has some cash, say, $10 each. Although they are preoccupied with finding food to survive, let's also assume that both wish to settle their mutual transactions in economic terms. Suppose A is more productive in finding food for his own needs and then some, leaving B free to tinker with his contraption. A can sell the excess to B. In next to no time B will exhaust his cash reserve. If B wants to continue consuming he has to issue IOUs to A. If not, the economic exchange breaks down. A can no longer save and B consume. To A, the $20 cash and the IOUs are his savings whereas to B the IOU s are debts. So the IOUs are actually money that supplements the $20 hard cash. In fact in the real world, there are more IOUs than physical cash. If B keeps on issuing IOUs with hardly any hope of ever redeeming them, A will realise one day that B's IOUs are as good as his worthless promise. The IOUs will lose their value overnight. 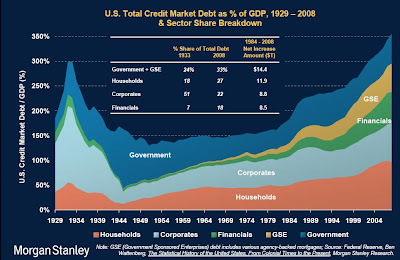 It's the collapse of the IOUs or credit that is the cause of economic depression. However, if suddenly, B could garner more food with his contraption than A with his muscle power, B's IOUs would retain their value. The money now moves in reverse provided A stops going about his usual food gathering business, using that opportunity to do other things instead. A and B's mini economy starts humming again until A's credit is fully stretched. If both parties come to their senses, they should specialise, say with one growing cereals and the other catching fish. They would trade their surpluses in such a way that no one excessively owes the other. In the real world of technological progress, this is very unlikely because one party can always outmanoeuvre the other with the help of technology. We can now surmise that what an economy needs to continue operating indefinitely are continuing economic growth and a change in the fortune of the players. This presupposes the arrival of a new technology that will step up economic growth and redistribute economic wealth but a deliberation on this topic deserves its own separate posting. Alternatively, when economic growth has run its course, the players could attain a stable relationship among themselves by producing just enough for their own needs, precluding the accumulation of disproportionate savings. The other important lesson, which actually is the subject of this post, is that savings and borrowings are indeed a zero-sum game. To be able to save, someone else must borrow. The proof for this assertion is the following diagram of a nation's GDP, taken from The Levy Economics Institute of Bard College site. On the left side of the top equation is national output or rather spending, commonly referred to as GDP while national income or GNI represents the right side. Making up the difference between a country's spending and its income is either net exports (income more than spending) or net imports (the other way round). Although the diagram appears self-explanatory, a little explanation would help. Net exports as you'll notice sits on the left side of the top equation. You may think that exports are income but that's incorrect. Exports are actually foreigners' spending on goods and services while the corresponding domestic equivalents are household (consumption and property investment), business (capital expenditure) and government spending. The income from that spending is on the right. If net imports were to appear, the item would be offset against the domestic spending on the left. Business operating expenditure doesn't appear as it has been accounted for in computing business gross profits. After some shuffling, the equation finally boils down to that of the last line. In the above diagram, the aim is to highlight business profits; the term Gross Profits actually means profits before depreciation since depreciation is a non-cash item. A modified Powerpoint page version of the above image can be downloaded for you to tinker with; you can change the flag to that of your preferred country. This version which puts government deficits on the left draws attention to the fact that in the present deflationary conditions, government's deficits is key to increased household savings and business profits. For other scenarios, you can move the icons around but make sure when you move icons from right to left or vice versa, the mathematical signs (+/-) are reversed. Right now, for most economies, the other contributors to savings are anaemic. Investments in the form of business capex are moribund because of excess capacity and falling prices. Investments in real property are reaching its end game that would inflict a catastrophic blow on those who haven't exited. Exports are out of the question when all countries are winding down their spending. That leaves only government spending but after years of mega deficits, the governments' backs are about to be broken. The increase in government deficits started during Reagan's days, towards the end of his first term (see chart below, taken from Morgan Stanley website). Now you know why Reagan was so popular. Clinton and Bush, Jr. continued this reckless practice with the non-government players (banks, corporates and households) doing the politicians' bidding. However these non-government players have been stretched to the limits of their borrowing ability after more than 15 years of continual credit growth. The US government took back the lead role in 2009 but after three years of more than a trillion dollar annual deficits, its critics are getting restless and demanding that the deficits be curtailed. What those critics fail to realise is that government deficits can never be tamed. Only the relative quantum, in this case reckoned against the GDP (see chart above) can be reduced. However, the absolute amount always increase year after year except when the households or corporates go on a borrowing binge, even then for short periods. For a big country like the US, the government can only go into surplus if the corporates and households are willing to endure increased borrowings. Only small countries can climb out of government deficits through exports. If the relative government deficits could be trimmed in the 1970s and early 1980s, can we repeat the same feat now? Unlikely because the two critical factors necessary for the reduction are missing. First is economic growth or GDP. Since its highs in the 1960s, decadal economic growth has been decreasing. More crucial is the high inflation experienced during those years. Yes, inflation benefits debtors at the expense of creditors. It doesn't reduce the actual debt amount but relative to the general price level, that is in real terms, your debt gets reduced. However inflation is not likely to make a comeback anytime soon because capacity now outpaces consumption. The policymakers' fixation with snuffing inflation is akin to generals fighting the last war. Anyway, the US credit expansion actually benefits the world. The chart (from The Economist) on the left shows that US current account deficits began to swell in the 1980s under Reagan's watch, turning the US from a creditor to a debtor nation. Soon after, President Bush, the first, suppressed the government deficits at a time when the Savings and Loan crisis led to a drop in the total credit. Not surprisingly, he didn't get a second term. But his successors continued Reagan's practice. As a result US current account deficits movement is a mirror image of its total credit growth. reserves (see left chart, also from The Economist). At present, the US dollars represent about 60 percent of the global forex reserves, down from 70 percent in the early 2000s. But more significant, without that 60 percent, the balance 40 percent wouldn't have existed simply because the other major economies, the EU, Japan and China, are current account surplus or creditor countries. The fact that their currencies are available as reserves is due to their ability to hold on to the dollars in exchange for giving up their currencies. As the US could no longer expand its credit, the currency leg of the 4C will soon begin its winding down. Prices across the board will start descending. You'll soon watch dumbfounded policymakers arguing over what tools to use to fight deflation just as it appears inflation was the scourge. They haven't learned the most important lesson: when faced with an insurmountable obstacle, like the tsunami, you don't fight, you adapt. They should encourage the cancellation of unpayable debts. Everybody has to take a cut so that life can start anew. Sadly, greed precludes this course of action. If financial savings can't be extinguished, borrowings can't be cancelled. The end result is a breakdown in social cohesiveness that will harshly hit both borrowers and savers.